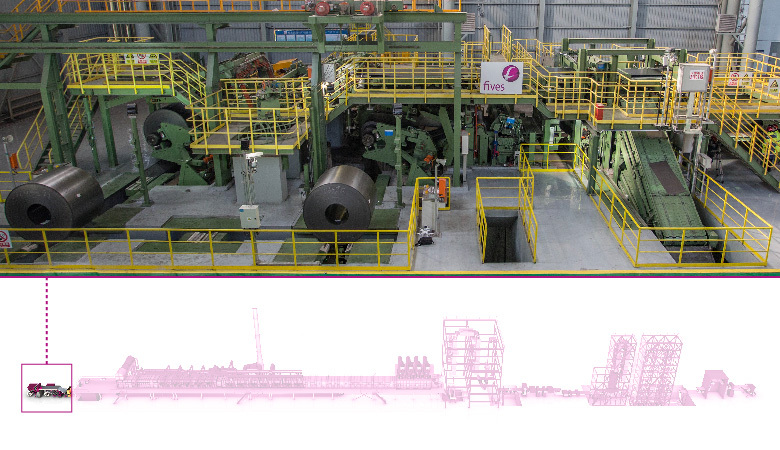 Fives developed NeoKoil® continuous galvanizing line (CGL) with a horizontal furnace and a companion minispangle system to produce steel grades from building to automotive applications quality. 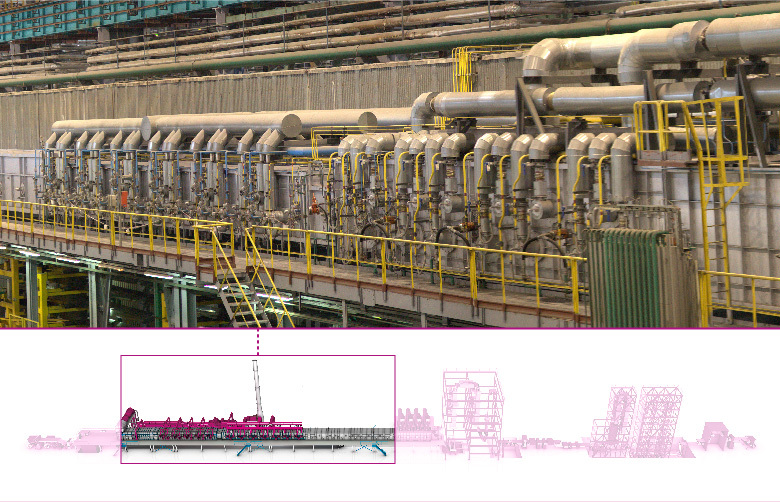 Such processing lines are cost effective and versatile. 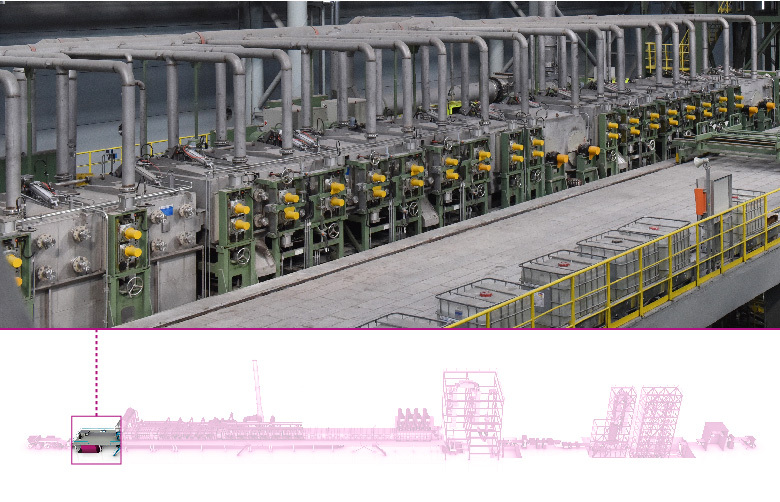 Fives references include more than 80 CGLs with vertical and horizontal furnaces producing steel grades from building to automotive quality, from mini-lines (10 mpm) to high-speed lines (180 mpm). The entry coil handling section is engineered to handle the coil very carefully, ensuring minimal waste and optimal product quality. It includes entry coil skid and car, pay off reel, threading pinch roll and flattener, shearing section (entry shear and scrap evacuation system) and coil joining section (welder and notcher). Fives' degreasing system utilizes a combination of hydro, chemical and mechanical processes. The hydro system uses hot water as the degreasing agent. The chemical systems include a multi-stage degreasing section where water with a degreasing agent is sprayed onto the strip at high temperature. This is followed by mechanical brushing of the strip surface to displace fines and stubborn oil from the strip. 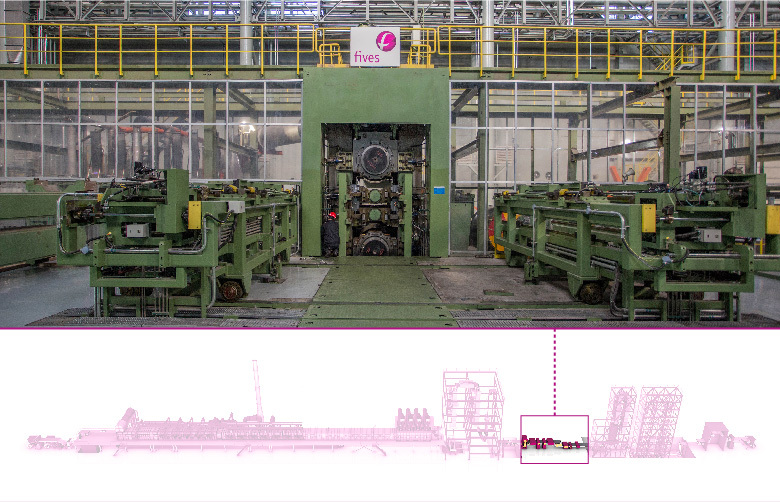 Stein horizontal furnaces for strip processing lines cover a full range of steel grade applications, such as building, white goods, non-exposed automotive parts, full hard, hot rolled products, etc. The furnaces feature low operation costs, shorter shutdowns during maintenance and easier operation. Fives' rapid cooling section offers a flexible and compact way to perfectly cool the strip. The compact design has a number of benefits, including better cooling rate control and significant energy savings. Fives has recently developed rapid jet cooling, which provides a high cooling rate of up to 75˚C/sec for processing high strength steel. Aeris®, after-pot cooling technology, is an efficient and flexible cooling system that improves strip stability by enabling the reduction of the cooling length. 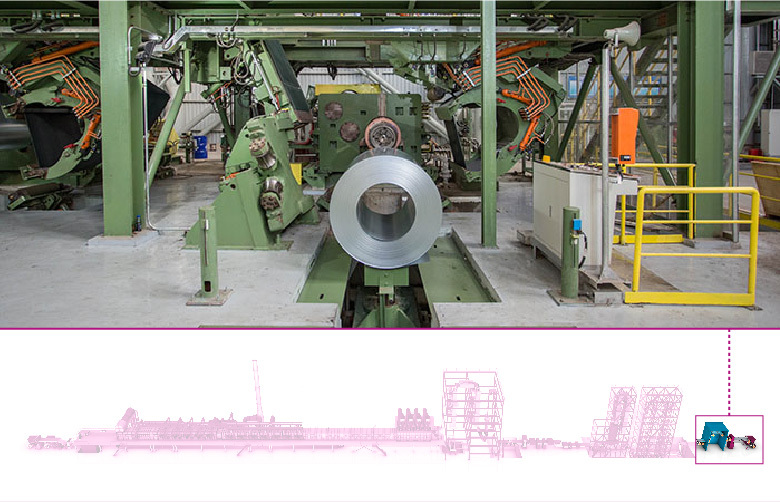 Fives has also developed the Stein minispangle system, aiming to minimize ‘spangles’ in galvanized strips in order to improve the surface quality for coating. DMS skin-pass mills coupled with DMS strip levelers are suitable for a wide variety of annealed and galvanized steel products from very low to very high strengths. They achieve the proper elongation and improve strip flatness in continuous strip processing lines. Fives’ mechanical solutions, including side trimming and SIS tuning for the exit coil handling section ensure minimized waste and achieve the desired throughput. Fives implements a strategy identification plan that begins at the steel shop and incorporates the hot strip mill, cold rolling and hot-dip galvanizing. 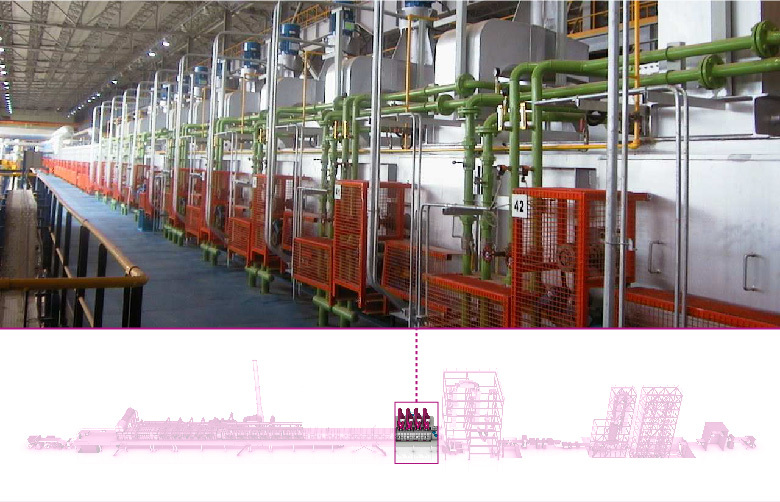 Eyeron™, real time quality management software to achieve steel process optimization.